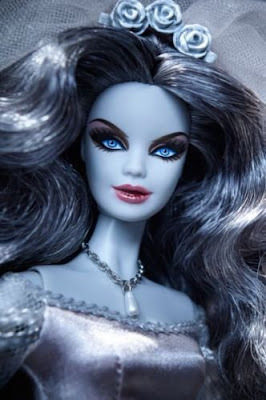 Mattel came out with their fourth "Haunted Beauty" Barbie just in time for Halloween 2015. 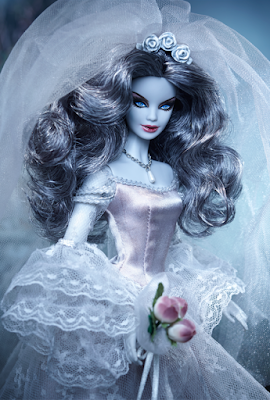 "Haunted Beauty Zombie Barbie" features an elaborate lacy white gown and veil, bluish gray hair, a gray pallor to her skin, and shockingly red lips. She wears a flower crown and pearl necklace. If I add her to my creepy doll collection, I'd be tempted to make a little haunted graveyard diorama for her to be displayed in. 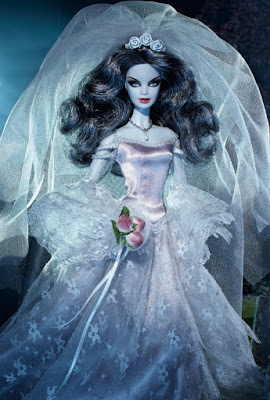 You can also buy the Haunted Beauty Zombie Bride doll on Amazon.